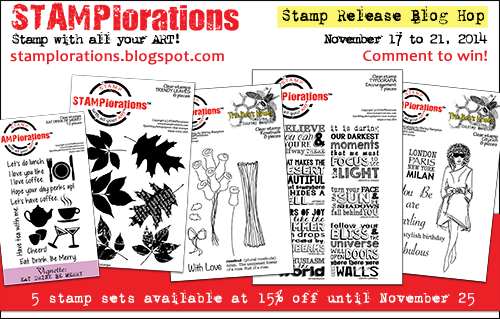 Welcome to Day 5, the last day of the November Stamp Release Blog Hop here at STAMPlorations! For complete info on our hop, including how you can win stamps, click here. Today, we're putting the spotlight on Trendy Leaves. We'll be picking one commenter to win this set so leave a comment here and on the rest of the STAMPlorations girls' posts for a chance to win the set. I love the colors and the way you fussy cut the leaves an put them on the edge. Gorgeous colours on these leaves. Unfortunately the leaf piles around here are very soggy so no kicking up those autumn delights today! I can't wait to bust into this set. Your card is so delightful with it's watercolory splendor! The glow of these leaves are fantastic and love how you added them at the edged panel!!! Delightful card! I love how you used the brown edge to make your leaves POP! Time well spent! Thank you for all of your shares on this fun new hop! This wonderful set is in my collection already, awaiting some attention. Your card here: amazing inking inspiration! Soooo gorgeous! Gorgeous card - love the Autumn leaves. Nice sketch! Love the leaf colors and the HB2U...nicely done! such great colours. Love the purple mixed in with the oranges. Beautiful mix of colours, love those colours in sentiment too! You've really made the leaves the star of this card, Shirley! The colors are gorgeous and the design is delightful! Great card. Love the balance of white space. Just lovely. I love the colors you have used! Love that leafy border! Beautiful! Gorgeous leaves, Shirley! Love the whimsical sentiment on this card, too! Well, I'd say that you totally 'kicked' these leaves - beee-u-ti-ful!!! And, stunning atop the deep purple paper! The leaves - great. It's truly magic how the results are always different but always cool. The icing on the cake - the multi-inked sentiment. What a great touch. Gorgeous background colour (not the white one :)) and Great mix with colouring leaves. I love this warm autumn card. I adore the leaves, but I am especially taken with the simple sentiment. The randomness of "HB2U" works perfectly with falling leaves! Gorgeous. Love the leaf border and the smaller sentiment at the bottom.